The XMOS Link processor bus is very latency tolerant, which allows it to be transported over a wide range of media such as wireless networks and ethernet. This project aims to transport the XMOS Link over cheap optical fibre from Avago Technologies (Versatile Link). 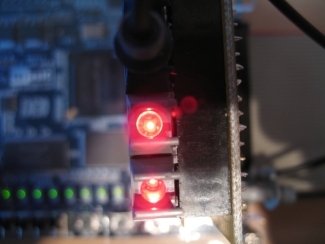 This is achieved by using an FPGA to convert the XMOS Link to a format that can be transported over the optical link. The FPGA receives tokens from one of the XMOS chips over a standard XMOS Link (2 wire) and transmits the received tokens over a standard serial link (9n1). The other side (also implemented in the FPGA) receives the serial data and sends them to the destination XMOS chip through a standard XMOS Link. There is no additional buffering. This means that the serial link speed must be fast enough to transfer the tokens, otherwise it will result in data loss. 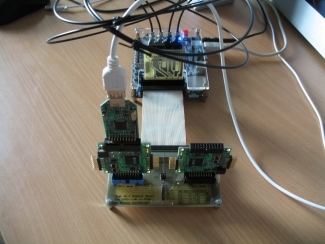 The project is implemented using two XK-1 boards and a Altera DE0 FPGA board. The FPGA board has two extension connectors. One of them connects to a custom PCB called the adapter board. The two XK-1 boards fit into the adapter board. The JTAG signals are connected to a standard XTAG2 header. The XMOS Links of the two boards are connected to the FPGA (and not to eachother). The other extension header of the FPGA board connects to a custom PCB which houses the optic transmitters and receivers. The ultimate goal is to eventually run multiple XMOS links at full speed using fibre optics used in telecom and networking, such as affordable GBIC Media Converters commonly used in professional network and router appliances. The project name is suffixed with '1' to leave room for future projects. This is really good Bianco, do you think you could get a video up? A video wouldn't be that interesting, it's just a few flashing LED's to confirm that the system is running and hasn't crashed. 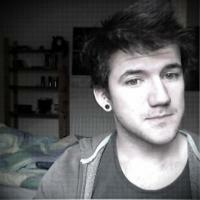 Besides that i do not have the current rig on my desktop anymore (It was from June).